This is Page 9 of an 10-page review. Click on the black links below to visit other pages. Today, when people make pesto, whose popularity has become global, they often use machines—blenders, food processors—rather than wield a pestle. After years belonging to that cult of motor-made sauce, we underestimated the importance and superiority of the mortar and pestle mashing method. To our surprise and delight, the old-fashioned device yielded a thick, bright green paste, the likes of which no machine had ever produced for us. Food writer Corby Kummer had a similar revelation in a 1998 article for the Atlantic Monthly called “Pesto by Hand,” an ode to the perfection of pesto made in a mortar and pestle. The pounding and pressing by hand slowly releases and amalgamates the ingredients in a way the cutting and grinding action of machines cannot achieve. We also liked that it kept us completely in control of our sauce and, even more so, that we didn’t have to worry about scrubbing any sharp blades or prying green stuff out of corners—a simple rinse with water does the trick, and quickly. We tried a number of recipes, but this one was our favorite, and the easiest. 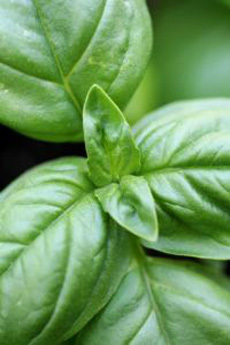 By pounding the basil first, a few leaves at a time, with coarse salt, the basil easily dissolves against the coarse mortar, as no other ingredients stand between them. 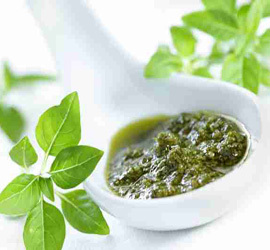 In addition to expediting the basil grinding—the most laborious task in any mortar and pestle-pesto recipe—this step releases so much basil essence that only a small number of leaves are required to season the sauce. The original recipe calls for Pecorino Romano, but we adored it, instead, with Pecorino Sardo, a younger, less salty sheep’s milk cheese from Sardinia. 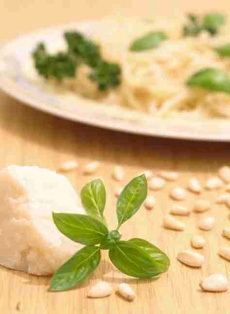 Pecorino Romano will be fine too, just pay attention to its saltiness. Place the sea salt and a few of the basil leaves in a mortar. Using a pestle, press and lightly pound the leaves and salt against the coarse bowl of the mortar, in a rotary motion, breaking the leaves apart. Keep adding a few more leaves and grinding them until you’ve used them all. 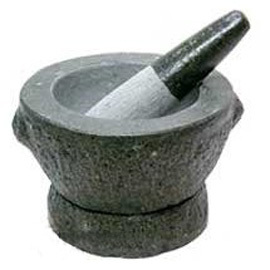 Many mortars and pestles are small, for grinding spices. This granite ensemble has a 7" diameter and a 2+ cup capacity—what you need to make pesto. Click here for more information or to purchase. Once all the leaves have been added, and before they’ve been completely pulverized, add the garlic and pound it until it releases its juices. Add the pignoli and pound them into a paste. Move the pestle around the mortar to combine the ingredients. Stir in the Pecorino and Parmigiano-Reggiano, then gradually add olive oil, stirring it into the paste (a spoon can be used for these steps, if you prefer). You should have a thick, creamy, homogenous, bright green sauce. BLENDER OPTION: If you decide to make this in a blender (preferable to a food processor, which basically just cuts through the ingredients where a blender grinds), heed advice from both Plotkin and Kummer: place all the ingredients in the blender, excluding the cheeses and half the olive oil. Process, adding more oil, if necessary, to get the ingredients moving. You will need to stop the blender regularly to push the mixture down. Once a paste forms, stir in the cheeses, as well as additional olive oil, if desired.